Dadi asks Anika to go in Shivay’s car with him. Anika maintains distance and makes excuse to go by taxi. Anika and Shivay’s come closer by the bracelet moment. Shivay feels the love yet again and suppresses his feelings. Shivay’s grand marriage becomes a delightful moment for the family. The guests ask about the groom Shivay. Tia dresses as the bride. She is worried thinking of her husband’s anger. Tia’s mom makes her ready. Tia is upset and thinks of her step to marry Shivay. She sends Anika from the room. Dadi and Pinky bless Shivay. Dadi sends Shivay to get Tia and come downstairs. Anika finds Tia upset. Tia is frustrated and argues with her mother in front of Anika. Tia’s mother gets nervous as the plan can fail. Tia is unable to hide her feelings. Anika gets doubtful on her. Shivay hides his feelings and prepares to marry Tia. Dadi asks Anika to call Shivay and Tia. Anika goes to tell Shivay to get Tia to the mandap. By the twists of Tia leaving the marriage on her husband’s saying, Anika will take Tia’s place on Shivay’s saying. 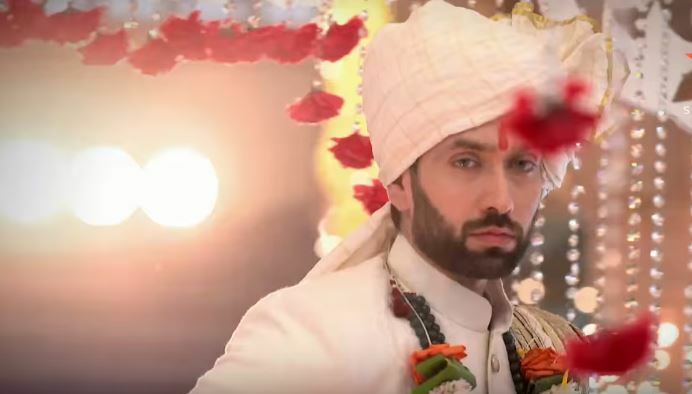 When Anika could risk her respect to save Shivay’s name from the murder case of Gayatri, the viewers can expect Anika to come forward to save Shivay’s respect in front of the world once again, by helping him when his bride runs away. However, the decision would be forced on Anika by bitterness. Later, Shivay fills sindoor in Anika’s hairline, while her face is covered in ghunghat. He makes her wear the mangalsutra, while hiding her face from everyone. The family does not know whom is Shivay marrying. They all are glad that Shivay is marrying Tia. Anika cries and stops at every step. Shivay holds her hand and makes her put garland in his neck. Shivay holds her hand and takes the wedding rounds, against her will. Anika could not stop him. Shivay was marrying Tia, and changed mind in the last moment. Anika has become Shivay’s wife and is unhappy. They both are not confessing what they feel for each other. Shivay and Anika get married by all the rituals, and take elder’s blessing. Dadi asks Shivay why does he look upset after his marriage. Shivay has maintained a long silence, while Anika is in shock by Shivay’s step. Anika does not know to be happy or sad by the marriage. When it’s revealed that the bride is actually Anika, there comes a big shocking moment for the family members. There will be mixed opinions on Anika for becoming Oberoi’s bahu, but the viewers will see romance and nok jhok of Shivika more. Keep reading.